Corridor between the fort du Salbert and the NATO Ouvrage G, in Belfort, France. English : Corridor between the fort du Salbert and the NATO Ouvrage G, in Belfort, France. A coral fungus (Ramaria flaccida), one of about 200 species in the genus Ramaria, photographed near Eggingen, Germany. English : A coral fungus (Ramaria flaccida), one of about 200 species in the genus Ramaria, photographed near Eggingen, Germany. English : Eurasian Bullfinch (Pyrrhula pyrrhula) at a bird feeder. The Immaculate Conception by Giovanni Battista Tiepolo depicting the Immaculate Conception of Mary. Oil on canvas painted 1767-68. Today housed in the Museo del Prado in Madrid. 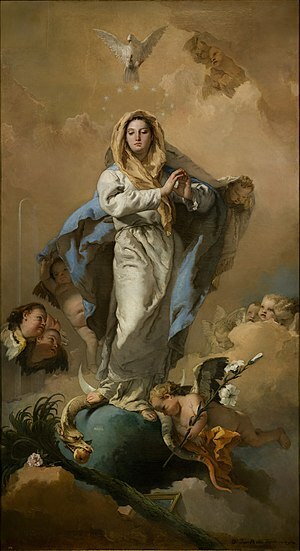 English : The Immaculate Conception by Giovanni Battista Tiepolo depicting the Immaculate Conception of Mary. Oil on canvas painted 1767-68. Today housed in the Museo del Prado in Madrid. English : This time-lapse sequence shows the young Moon setting over ESO’s Paranal Observatory in Chile. As well as the bright crescent the rest of the disc of the Moon can be faintly seen. This phenomenon is called earthshine. It is due to sunlight reflecting off the Earth and illuminating the lunar surface. This video was taken on 27 October 2011 and also records the planets Mercury and Venus. King Penguin (Aptenodytes patagonicus patagonicus), West Falkland. English : King Penguin (Aptenodytes patagonicus patagonicus), West Falkland. The reconstructed medieval Church of St. George in Kyustendil, Bulgaria. The original building is from the end of the 10th and the beginning of the 11th century. English : The reconstructed medieval Church of St. George in Kyustendil, Bulgaria. The original building is from the end of the 10th and the beginning of the 11th century. The large Large Magellanic Cloud galaxy in infrared light as seen by the Herschel Space Observatory and Spitzer Space Telescope. English : The large Large Magellanic Cloud galaxy in infrared light as seen by the Herschel Space Observatory and Spitzer Space Telescope. English : In all, about 25 percent of the ice that melted between 2003 and 2010 occurred in North and South America (excluding Greenland). Steinway & Sons concert grand piano. English : Steinway & Sons concert grand piano. 1908 poster for Giuseppe Verdi's Aida, performed by the Hippodrome Opera Company of Cleveland, Ohio. 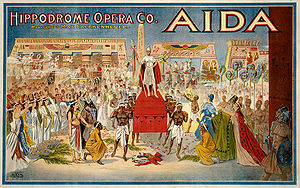 English : 1908 poster for Giuseppe Verdi's Aida, performed by the Hippodrome Opera Company of Cleveland, Ohio. English : The Nakagin Capsule Tower is a mixed-use residential and office tower designed by architect Kisho Kurokawa and located in Shimbashi, Tokyo, Japan. A Yellow-bellied Slider (Trachemys scripta scripta) basking on a log at Smithsonian National Zoological Park in Washington, D.C., USA. English : A Yellow-bellied Slider (Trachemys scripta scripta) basking on a log at Smithsonian National Zoological Park in Washington, D.C., USA. English : A short video illustrating smart glass, or electrochromic glass in action. Animation of the act of unrolling a circle's circumference, illustrating the ratio π.
English : Animation of the act of unrolling a circle's circumference, illustrating the ratio π.
English : Goldfish scooping (金魚すくい Kingyo-sukui) is a Japanese traditional game in which a player scoops goldfish with a special scooper. Waldemarsudde, the former home of the Swedish Prince Eugene, and today a museum located on Djurgården in central Stockholm. English : Waldemarsudde, the former home of the Swedish Prince Eugene, and today a museum located on Djurgården in central Stockholm. English : Children's Python (Antaresia childreni) consuming, then regurgitating what appears to be a Slaty grey snake. Newly constructed windmills on the Thornton Bank, 28 km off shore, on the Belgian part of the North Sea. The windmills are 157 m high, 184 m above the sea bottom. English : Newly constructed windmills on the Thornton Bank, 28 km off shore, on the Belgian part of the North Sea. The windmills are 157 m high, 184 m above the sea bottom. A photograph of Charlie Chaplin made ​​in the United States during his youth (1900-1910s). English : A photograph of Charlie Chaplin made ​​in the United States during his youth (1900-1910s). English : A norry or nori is an improvised rail vehicle from Cambodia. Male Paper Wasp of the species Polistes dominula, Portugal. English : Male Paper Wasp of the species Polistes dominula, Portugal. English : Butterflies fly freely around among visitors - Montreal Botanical Garden. Lakeside of the Mono Lake with Tufa columns in the Mono Lake Tufa State Reserve, California, United States. English : Lakeside of the Mono Lake with Tufa columns in the Mono Lake Tufa State Reserve, California, United States. English : Lucas Brunelle riding a bike along the Great Wall of China (1m 11s). Shell of Tutufa bufo, the Red-ringed Frog Shell or Red-mouth Frog Shell. Shell length 101 mm. English : Shell of Tutufa bufo, the Red-ringed Frog Shell or Red-mouth Frog Shell. Shell length 101 mm. English : A drive through Cattenbroek (4m 23s). The Great Fountain Geyser erupting at sunset at the Yellowstone National Park, Wyoming, United States. English : The Great Fountain Geyser erupting at sunset at the Yellowstone National Park, Wyoming, United States. English : A dung beetle climbing a dung ball for circumspection. Pickerelweed (Pontederia cordata) at Plaisance National Park in Quebec, Canada. English : Pickerelweed (Pontederia cordata) at Plaisance National Park in Quebec, Canada. English : The Möbius strip is a surface with only one side and only one boundary component. It has the mathematical property of being non-orientable. It is also a ruled surface. Buffalo soldiers of the 25th Infantry, some wearing buffalo robes, Ft. Keogh, Montana. English : Buffalo soldiers of the 25th Infantry, some wearing buffalo robes, Ft. Keogh, Montana. English : Blue Wonder bridge in Dresden, Saxony, Germany. English : Mandarin oranges (Citrus reticulata). English : Bells of the church of the Annunciation, Nazareth, Israel. Megyeri bridge at dawn (before its planned opening), Budapest, Hungary. English : Megyeri bridge at dawn (before its planned opening), Budapest, Hungary. Wedding of Victoria, Crown Princess of Sweden, and Daniel Westling; Cortège at Slottsbacken. English : Wedding of Victoria, Crown Princess of Sweden, and Daniel Westling; Cortège at Slottsbacken. English : 70 years ago today, The Bulleteers, the fifth of the 1940s Superman animated Technicolor short films, was released. Rotary dial telephone, probably from Belgium (the circuit diagram inside is in Dutch and French). English : Rotary dial telephone, probably from Belgium (the circuit diagram inside is in Dutch and French). English : Two photographs of Karori reservoir from 1988 and 2012, converted into an animation to show changes in the lake and surrounding forest over the 24 year interval. After the lake level was lowered, the lake banks were reclaimed by natural regrowth of the forest. Also many trees have grown, and a few trees have been removed (mainly exotic species) as part of Zealandia's 500 year restoration project. Wellington, New Zealand. Škoda 15T, a new model of low-floor tram from Škoda Transportation, currently being operated in Prague and Riga. English : Škoda 15T, a new model of low-floor tram from Škoda Transportation, currently being operated in Prague and Riga. English : Galaxy with a rotation curve as predicted without the effects of dark matter. The other regions of the disk rotate slower than the inner regions. Vincent van Gogh's Bedroom in Arles. English : Vincent van Gogh's Bedroom in Arles. A small grain elevator on a farm near Moose Jaw, Saskatchewan, Canada. English : A small grain elevator on a farm near Moose Jaw, Saskatchewan, Canada. English : The Helena Bridge is a cantilever bridge carrying US 49 across the Mississippi River between Helena-West Helena, Arkansas and Lula, Mississippi.